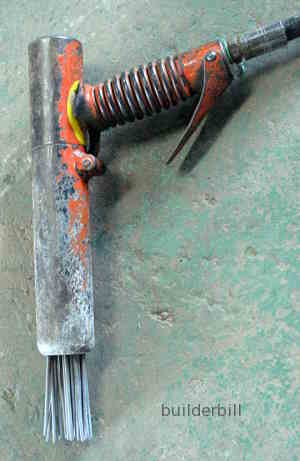 An compressed air tool used for cleaning rust, welding slag and scale off steel. Also used for creating a textured finish and removing laitance on concrete. Also known as scabblers. These scalers are extremely noisy, especially when used on steel so use double ear protection, ear plugs and good ear muffs. If you ever walk past a boat repair or maintenance yard then it is common to hear the loud rattling of these tools as they are used old paint, rust and weld slag off steel hulled vessels. They throw off chips so always use eye protection, gloves and stout clothes. Wearing a leather apron is a good idea. They are used for cleaning up steel welds and removing slag and weld splatter. They are excellent for removing layers of rust and scale. On concrete they are very useful for removing laitance on critical concrete joints, because of their small size and ability to work around and close to rebars. On smaller concrete details they can also be used for decorative finishes giving a fine textured effect. In certain cases these scabblers can remove old flaking paint layers.